I remember really loving this book as a kid. It probably wouldn't live up to my memories if I reread it, but I believe my child self's opinion holds more weight when judging a children's book than my current self's. The book Peter Raven Under Fire by Michael Molloy is about this kid named Peter Raven. He joined the Navy at a young age. He got the title Midshipman. He got the privilege to join the ship the Torren which is uncle was the captain. He was with the ship for little under 5 months when it was attacked by this mad man named Count Vallon. Only 5 people survived the attack, one of them was Peter. Also some of his friends from the Torren survived their names are Beaumont, Connors, Batt, and Matthew. Peter swore that he would kill Vallon for killing his shipmates and his uncle. Peter and the rest of the people that survived the attack made a group of spies to assassinate Count Vallon. They hired a pirate crew called the Wasp. they went out to Paris to find Count Vallon. While there Beaumont falls in love with this girl named Lucy Cosgrove. (Lucy later fell in love with Beaumont and they got married). Count Vallon also fell in love with Lucy and kidnaped her and was going to make her marry him. But Beaumont, Connors, Batt, Matthew, Peter, and the Wasp crew followed them. They went to Count Vallon's home. They made a plan to rescue every one, free the slaves and get out alive. Connors and Matthew went out to find Lucy while the Wasp crew, Beaumont and Peter fought the guards. Peter and Beaumont made 2 bombs but only one of them went off so Peter went to set the other one off. He set it off and hid in this staircase and that is were he met Count Vallon. He fought him and killed him. Lucy was saved by Connors and Matthew. They then took all of Counts Vallon's gold and distributed it between the five of them. They then found out that Peter was getting married to a girl named Nancy. Text-To-Self/ Text-To-Text connection. In the end of the book they talked about the Louisiana Purchase. I can connect to this because I learned about this. They said that is was the best deal in the Worlds history. It connected also back to the book because it said that because Napoleon didn't get his gold from Count Vallon he couldn't sent more tropes in to Santo Domingo. so he had to sell Louisiana and the rest of the french territory in America.I would recommend this book to people that like pirate stories and for people that like a happy ending. I think this because the whole book is about pirates and Marinas also because it has a happy ending. I would give this book 5 stars because it was a fantastic book that kept me at the edge of my seat every time I read the book. 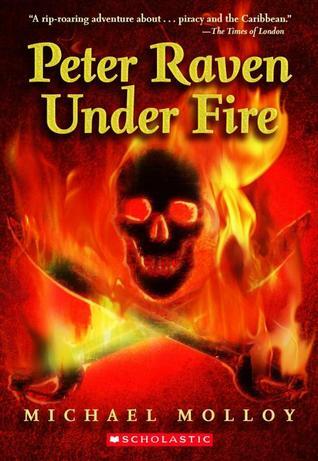 Peter Raven Under Fire is an epic historical fiction story that is full of adventure and gruesome battles. Peter Raven is a thirteen-year-old boy who joins the Royal British Navy during the war with Napoleon Bonaparte. While working on his assigned ship the HMS Torren, Peter becomes friends with an African Clerk named Matthew Book. The ship is soon taken over by the horrible pirate Count Vallon and everyone on board but Peter and Matthew are killed. Peter decides to seek revenge on Count Vallon and joins forces with a network of spies to help bring him down. While spying on Count Vallon, Peter discovers a plot by Napoleon Bonaparte to take over America. With this information Peter and the British spies must fight to stop both Count Vallon and Napoleon from taking over America and the Caribbean. The story is exciting and full of action but the overall plot is hard to follow. There are too many shipping and boat references that get confusing if you don’t know anything about boats and several different subplots make it hard to remember characters. The author attempts to make the book appealing for girls by including Lucy, American girl who loves to hunt and read instead of wearing dresses and going to balls. Although her character is interesting and dimensional in the beginning, by the end she falls prey to stereotypes and begins to wear dresses and flirt with boys. The story is also very gruesome and had some disturbing aspects including torture, bodily mutilation and bloody deaths. The book is not for the skittish or faint of heart. I would not recommend this book to any child under the age of thirteen. Reviewed by Grandma Bev for TeensReadToo.comThirteen-year-old midshipman Peter Raven is assigned to active duty aboard the HMS Torren. Boys became men early in England in 1800, and Great Britain is in her seventh year of struggle with France. The French Revolution is over, and Napoleon Bonaparte is in power. He needs money to defeat the English and exploit the Louisiana territory where he plans to install a "King of New Orleans" under French rule, and has chosen one of the privateers that are active in the Caribbean; a vile and quite mad pirate that has promised him the money he needs. These pirates attack any ships that cross their paths, murdering the crews and stealing the cargoes. When the HMS Torren falls prey to the pirates, Peter and the charismatic Matthew Book manage to separately escape, but everyone else is murdered. Peter becomes apprenticed to a British Spy, and is reunited with Matthew. The three of them strive to outwit the pirates and French government and keep America out of their hands. This lively book has a multi-level plot and exciting characters. I thought the size of the book might be a bit intimidating for reluctant readers, but it left me wanting more. The action goes from the English Channel to Paris to the Caribbean and back again. It's a seafaring adventure on a grand scale that is impossible to put down. Molloy promises a sequel, and I can't wait...Peter Raven is one of my favorite characters. There is even a bit of romance with the beautiful, rich young American girl, Lucy Cosgrove. First a disclaimer: I actually found this in the children's dept. at the library, but it feels more teen book to me.Some parts of this book were so great. I have an intense love for stories of the British navy thanks to Horatio Hornblower, and the 1st half of this book delivers a lot of awesome seafaring adventure. The second half introduces some truly bloodthirsty pirates, which I also enjoy, while at the same time being totally squicked out by. I liked the history too, although I don't know enough about the Napoleon era to know what was real and what was invented. I need notes about this sort of thing, authors!But really, the weak link in this book is Lucy. I have no affection or empathy for our leading lady. I think I was supposed to like her because she's all spunky or whatever, but she felt very hollow to me. When two of the main characters (and about a thousand minor characters) fell madly in love with her, I was perplexed. When she was in mortal danger, I was unmoved. When she was rescued, I really wished we could get back to Peter and his heroics. Honestly, even Nancy the spy who's only in the book for a couple of pages was more interesting than Lucy. Luckily, she's not in the book that much! So, all in all, I liked the book. Very exciting, couldn't put it down. But in the future, Michael Molloy, if you're going to write a rip-roaring naval adventure, either create a truly compelling female lead or leave the ladies out of it. I about choked on dinner when I read, "Peter boards the HMS Dolphin" Jacky Faber is on the HMS Dolphin! Bloody Jack! What! But Peter is only on the beloved Dolphin for 3 days until he is picked up at sea by the British man-o'-war, the Torren. This book has all the adventure you could want with spies, nobility, pirates, sailing the high seas. The only problem I had was the main charater didn't have a personality. Half way through the 500 page book Peter starts to pick up one, or maybe I just gave him one for the lack there of. And every sailor but one on the Torren was kind. Is that believable? Some sailors signed up willingly, but most were pressed or sentanced. That dosn't leave many nice folks to be happy about living off of rationed weavly bread and salt meat. I really enjoyed the plot. High seas adventures set in the 1800s are some of my favorite stories. Had I been a young adult reading this book, I would have completely enjoyed it. However, being a more mature reader now, I unfortunately found some things that really bothered me. Peter, the main character, really had no personality. He was brave and loyal and true but almost too perfect. The romantic story was tucked in at the end and was not satisfying at all. And there were many details that seemed to be skimmed over.All in all a satisfying fun and quick read. Not a classic to be cherished, but I would recommend it all the same. A fun story. Worth mentioning if only because I found this it in the 25 cent overstock bin at the NY library, source of a bunch of cool books over the past few years. Any writer or publisher with a new book sends them a bunch of copies, more than they can keep. Historical fiction, a naval adventure that I came to realize was written not for kids exactly, but "young adults." 1800 or so, the world's powers are fighting and scheming over who will get the Louisiana Territory, but doing so from everywhere else. I got this book when I was only 8and enjoyed it (even though it took about a year). Now I've read it again and now noticed historical and nautical mistakes in it, who really cares though? But overall it's still a great book about piracy, friendship, espionage and the sea. I recommend it to all, but especially to the fans of Treasure Island. My sister read this book first and fortunately warned me that it wasn't that great. She was right. The story follows three characters (one of which seemingly randomly until a long way though), all of whom were excruciatingly flat. If you want to read Naval fiction for teens, try theBloody Jack Adventures by L.A. Meyer, they're a lot more exciting. I thought this was a really fun book. I would have given it five stars if there were two things different: I don't want swearing, and I don't want head jumping. DOn't let the head jumping bother you, its my mom's fault that I find it bothersome. The swearing, unfortunately, is to be expected since this is about seafaring. I thought it was exciting and I never got bored. I read it a while ago, and remembered thinking it held great promise, but was disappointed by heavy-handed historical details that bogged down the plot. I just remember being kind of bored. Slow at the beginning, and the end was disappointing. Other than that, the plot of this book was okay. swashbuckling epic! anyone who loves historical adventure you must read. This book is a little young, but it was my favorite book in Middle School and is still high on the list. I love historical fiction, and this one is a good example. Swashbuckling pirate fun! Who can beat that? Patrick O'Brien read-a-like for the 12 and under set. Engrossing and Enjoyable. author uses words not invented at the time of story. nuff said. Michael Molloy - As a counterpart to his career as a writer of children's books, Michael Molloy is a regular contributor to the Guardian newspaper. He lives in London, England, with his wife, Sandy, their three daughters, Jane, Kate, and Alexandra, and their two dogs, Fred and Daisy.